Even though this Toronto Maple Leafs mural was painted in Oakville, Ontario, I also sell cool hockey wallpaper murals that ship for FREE in Canada and the USA! They’re super simple to hang and totally removable when you’re ready to redecorate. 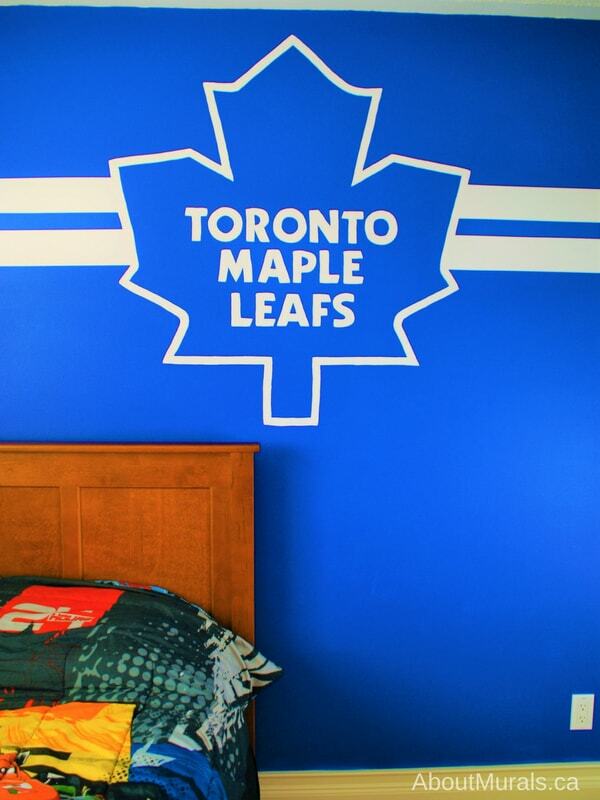 Are you thinking of a Toronto Maple Leafs mural for your kids bedroom (or a man cave, even)? Here are some photos of a mural I painted in a boy’s bedroom so you can get inspired! This little boy is a huge hockey fan…he plays it, watches it and lives it and his fave team is the Toronto Maple Leafs. 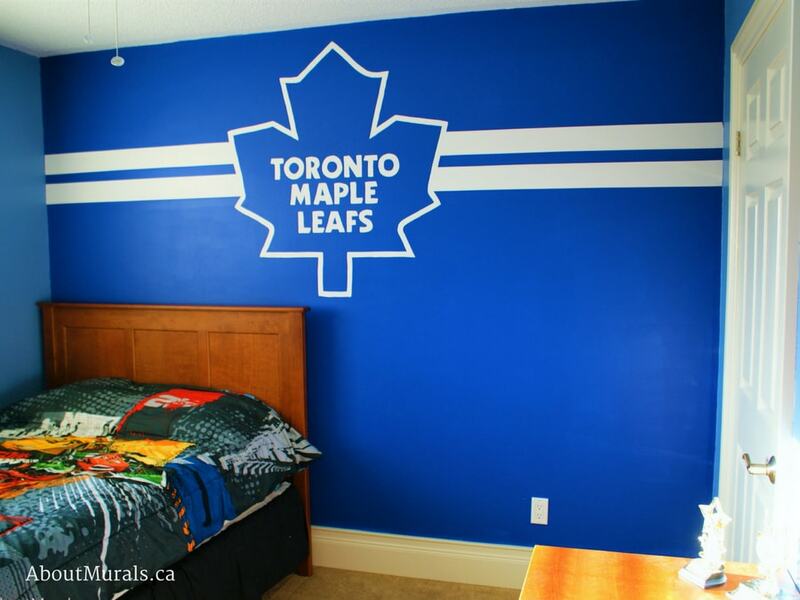 His dad wanted a Toronto Maple Leafs mural painted that had a cool, vintage feel. His dad painted the dark blue wall before I came to paint the mural for this sports fan. Latex painting is a service I offer before painting my wall murals, if you’re not the DIY type. 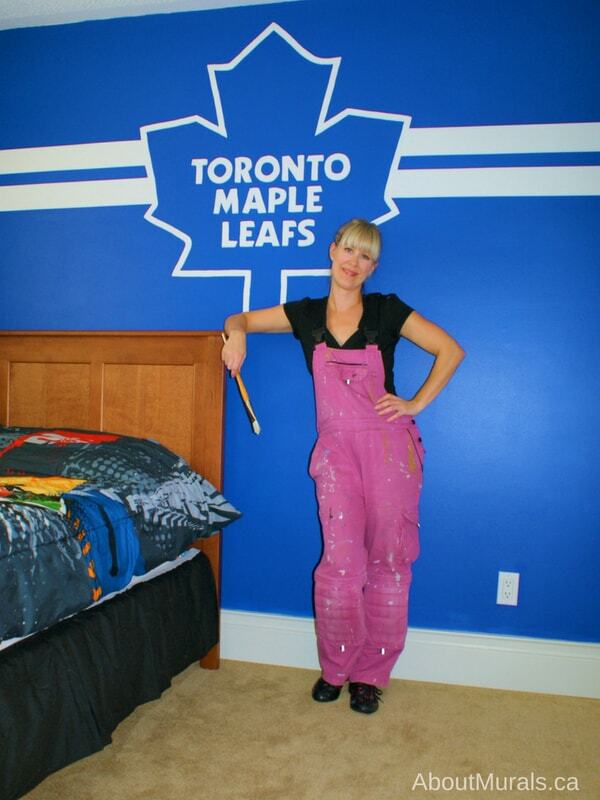 I painted the Toronto Maple Leafs mural in white with two horizontal stripes on either side. The mural is larger than life at about 4′ in diameter. I paint all my murals with no-toxic acrylic paint and no-VOC latex paint, so it’s safe for your kids to sleep in their rooms – even the night I finish painting the mural. If you’re thinking of a hockey mural for your kids room and you like my style, you can hire me! Gimme a shout for a free consultation. My prices start at $350. Or…Check Out My Wallpaper Murals! I sell cool hockey wallpaper murals that ship for FREE in Canada and the USA – some of them even have the famous blue hockey jerseys! Do you like hot coupon codes? Like to shop for sales? Join my newsletter community and you’ll save loads!